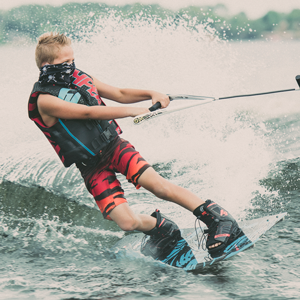 The flex of a wakeboard binding can vary from stiff, to very flexible, based on the model. What do you like? Do you like to be locked into your boots with a lot of support around your ankles so you can carve and gain speed on the water? Then you would probably want to stay towards boot models that are stiff with less flex. Do you like to have a lot of mobility to do tricks? Then you might consider a softer, more flexible boot. It is important to have the right size boot for wakeboarding. Controlling your wakeboard with loose fitting boots is like trying to run in high heels – you don’t have much control. Your boots should fit tightly, but not be painful. Most bindings are designed to fit a range of shoe sizes. 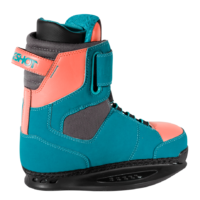 Many wakeboard boots have heat moldable liners that are designed to improve fit and reduce the need for boot lubricant which helps get you into a snug, properly fitted boot. When choosing a boot, you might consider finding one that exactly meets YOUR qualifications, even if you share a board. Many riders will have separate boots for each rider. But of course, we know this is not a possibility for most families. There are great options out there for those who have to share their bindings with different size feet. This binding is great for those who share or who have growing children. With open-toe boots, multiple shoe sizes can fit comfortably. An added plus is the fact that you can adjust the laces to have the boot fit more snug, or loose. 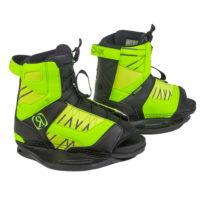 These wakeboard bindings are better fitted to your feet, which makes controlling the wakeboard easier. You will have increased leverage and quicker heel-to-toe response. Closed-toe bindings also keep your feet warmer which is great for preseason rides.